Fred & Lois Langhorst: A largely overlooked mid-century practice that produced noteworthy projects, earned a place in the history of Bay Area architecture, and remains a cautionary tale for the profession. Fred Langhorst, originally from Oak Park, Illinois was a Taliesin apprentice from 1931 to 1936. Following his apprenticeship, Langhorst moved to Los Angeles, then San Francisco, where he developed his own practice. He married Lois Wilson in 1939. Lois (Wilson) Langhorst was a native of Kiowa, Oklahoma, and a graduate of the University of Oklahoma with degrees in architecture and sociology. She also earned a masters degree in architecture from MIT in 1940. In spite of her credentials, Lois Langhorst was not permitted to work in the prominent Bay Area office of William Worchester, as Wurster feared that the mere presence of a woman in an architectural studio would damage the fragile esprit de corps of his all-male staff. Lois and Fred opened an office together in 1942, as equal partners, but because Lois was not licensed until 1948, Fred was often credited as architect of record. When Fred was unable to work due to his alcoholism, Lois ran the practice. Fred maintained his relationship with Frank Loyd Wright through the years, and that relationship is evident in the work. Lois' affinity for fellow Oklahoman Bruce Goff made her sympathetic to the values of organic architecture. Their 1947 residence in Lafayette is typically Usonian, with its sweeping horizontal planes, but without the ornament typical in Wright's work. Regardless of her skills as a designer and her ability to manage an architecture firm, Lois continued her work, against the prevailing current of sexism within the male-dominated profession of the era. The couple closed their practice in 1950, as they struggled with problems in their marriage, no doubt exacerbated by Fred, who took credit for one of Lois' prize-winning designs. The couple divorced in 1955. Lois continued to work in the Bay Area through the early 1960s. She also earned a degree in architectural history at Harvard and taught at the University of California at Berkeley. However, she was denied tenure at Cal and later would be "unwillingly retired" from the University of North Carolina. She passed away in 1989. Following their divorce, Fred Langhorst attempted to re-establish his office without Lois, but ultimately failed. Interestingly, Lois is credited with the enduring design innovation of the kitchen island. Regardless of her ubiquitous contribution to residential design, the life and work of Lois Langhorst remains a shameful tale of the failure of the architectural profession to take up its appropriate leadership role in society. Page from 1946 "California Plan Book" crediting Fredrick Langhorst as "Architect" and relegating Lois Langhorst as "Associate." Humanitarian projects in South America took me to Cochabamba, Bolivia late last summer. Between road trips into the high elevations of the Andes to scout construction sites, struggles with hypoxia, and eating llama, I managed to see some remarkable architecture. Ruins of a Spanish mission constructed in 1785 at an altitude of 12,000 feet. Dry joint stone masonry walls serve as llama pens among the thatched roof adobe homes of the Indigenous village of Coiyuma at 13,000+ feet. Cochabamba, in the center of Bolivia at an elevation of 8,300 feet above sea level is the beneficiary of a mild climate and often called the "City of Eternal Spring." The public square is occupied well into weekday evenings in late winter under the cathedral belltower. The Teleferico provides the primary mass transit of La Paz, carrying passengers from the higher elevations at the rim of the expansive city down several thousand feet of elevation into the various urban centers of the dense metropolis. A web of telephone and power cables tangles its way over the cobblestone sidestreets of La Paz. Downtown La Paz, with modern-day colonial governmental buildings. A quick study for a client's project (rental development...agricultural theme?) in East Contra Costa County. 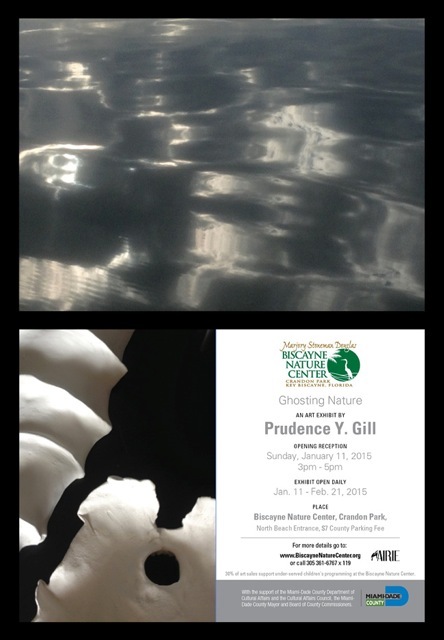 Highlights from Gallery Show "Ghosting Nature"
Prudence Gill, former curator of the Hopkins Hall Galleries at The Ohio State University and brilliant artist in her own right, just concluded a show at the Biscayne Nature Center on Key Biscayne, Florida. Larger-than-life scale ceramic interpretations of familiar found objects among the Keys and coastal waterways demand attention and new consideration as fossil remnants. Of course, with climate change threatening the already-stressed ecosystems of the Florida Keys, these elements seem to auger a natural history retrospective of a long-gone epoch, reminders that such rapid change makes each present moment recede so much faster. Certainly, the harried pace of the (post)modern world that threatens these places no doubt also make Gill's childhood memories of the area seem so much older than they could be. Objects in mirror are closer than they appear. Every texture and feature is magnified in Gill's treatment of mundane beach items: an urchin, a piece of coral, small shells. Such amplification of scale is only possible by an abundance of information drawn from close observation by younger eyes and small, nimble fingers. Conversely, native wood re-emerges carved into a boat form, bearing a miniaturized cypress swamp. Gill's deeply personal study and treatment of the familiar objects of the Florida Keys becomes a spiritual recollection in "Ghosting Nature." These aren't any beaches or an archetypal swamp nor is her work cold cartography; Gill renders impressions of her childhood habitat from a soul connection with particular places. Small gestures reveal a scale of intimate connection with an expansive location. It is easy to see the artist as an innocent and exploring child in these installations as these impressions are rendered with the joy of first experience. We get to see the beauty of life by the water without the cynicism or prejudice of our own experiences, but as a child. In 1938, Theodore van Fossen, at 19 years old, received a commission for the design of a new home from Robert (Bob) and Mary Gunning for their property east of Columbus in what is now Reynoldsburg. Fig. 1 > Conference just prior to client presentation of the Gunning House design. From left, Theodore van Fossen, Larry Cuneo, and Tony Smith. The site, a wooded ravine, would provide an opportunity to make manifest what he had learned in his independent studies and the more formal curricula at the New Bauhaus in Chicago. Immediately, van Fossen contacted his friend, Tony Smith, to collaborate on the project. Subsequent additions enlarged the home, including the 1963 Tower designed by van Fossen and constructed by Rush Creek Village builder Richard Wakefield. Today's article in the Columbus Dispatch discusses the recent purchase of the Gunning House property, named "Glenbrow" by van Fossen, and its renovation, now in progress. Fortunately for its new owners and for posterity, Bob Gunning was a talented photographer who documented his beautiful home as it grew over the years, beginning with these images in 1940. Fig. 3 > Sandstone throughout the house was quarried on site. Fig. 4 > The western bedroom prior to a subsequent addition. Fig. 5 > Detail of trellis element incorporated with adjacent existing mature maple. A brief video of the brilliant Pepinsky Guest House installation by Jeff Haase and Kyle Wallace at the McConnell Arts Center in Worthington, Ohio, taken with an iPad the day after the opening, demonstrates a parallax effect in the interior as the viewer attempts to reconcile the fractured surface information against the changes in the relative depth of surfaces. "Neighborhood in Harmony with Nature: Rush Creek Village" opened last Thursday evening at the McConnell Arts Center in Worthington, Ohio. Beautiful photography, models, and custom furniture highlight a installation by Ohio State Department of Design Professor Jeff Haase and MFA Student Kyle Wallace: a full-scale model of the Pepinsky Guest House. In order to make the piece portable (an important feature to permit the show to travel), Jeff struck upon the idea of using his iPhone and fashioning a jig to insure the consistent and proper range from the surfaces so that photos he took would print out at full scale. In all, he took thousands of photos of every surface of the structure, and then adhered them to the model with wheat paste. The effect is amazing, like an assembled panoramic, fractured, with a cubist sensibility. Walking into or around the model instantly replicates the experience of the actual building. In short time, however, attention is drawn to and held by the variations in shade/color/perspective of the individual images and the original sensation is suspended. A minute later, as the occupant moves about, the brain blends it all back together again and the sense of occupying the Pepinsky Guest House returns. It's a remarkable effect and a remarkable installation.